Polls in Zimbabwe's parliamentary election have closed following a day of voting which saw none of the violence of previous ballots. A local poll monitor told the BBC that the voting process had been "smooth", but pointed to earlier problems. 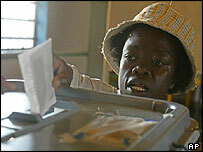 By the afternoon, long queues of voters had disappeared from many areas. As he cast his ballot, President Robert Mugabe dismissed as "nonsense" claims that the poll would be rigged and said he was confident of victory. Human rights groups say the poll cannot be free and fair and suggest that thousands of dead people are listed on the electoral roll. Reginald Matchaba-Hove of the Zimbabwe Election Support Network, which has some 6,000 observers in the 8,000 polling stations, told the BBC's Focus on Africa programme that the atmosphere had changed in the past few weeks, when foreign observers started arriving. We have been ruled by the same party for the past 25 years and they have done nothing to help us in our cause. 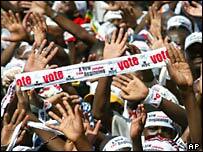 Zanu-PF is the only party in Zimbabwe that has a vision for the country. He said that previously, the opposition had little access to state media and were not free to campaign. On Thursday, Zimbabwe arrested two British journalists working for the Sunday Telegraph on charges of reporting on the country's election without state accreditation, police said. The offence carries a fine and up to two years in prison. Toby John Harden, 37, and Julian Paul Simmonds, 46, were arrested while travelling with an opposition politician. Counting is due to start now that the polls have closed. Preliminary results are expected within 48 hours. Mr Mugabe was confident as he turned up to vote in the capital, Harare, accompanied by his wife Grace and young son Chatunga. "It's going to be a victory for us - by how much, well, that is what we will see." As he cast his vote in Harare, opposition Movement for Democratic Change leader Morgan Tsvangirai also said he was confident of victory, although he said the poll was not free and fair. "The people will speak today and I am hoping that the outcome will be an MDC victory, I have no doubts about that," he said. One hundred and twenty parliamentary seats are up for grabs. A further 30 MPs are appointed by President Mugabe. A two-thirds majority for the ruling Zanu-PF party would allow the constitution to be changed, which correspondents say could be crucial when it comes to planning for the post-Mugabe era. Constituency boundaries have been changed to favour the ruling party. The government dismisses all such reports as groundless, and has introduced transparent ballot boxes it says will reduce the scope for cheating. Despite the general atmosphere of peace, an MDC polling agent in the south-western Insiza constituency has been abducted, the party says. During the campaigning, Mr Mugabe accused the MDC of being a stooge for UK Prime Minister Tony Blair, who has opposed his policy of seizing white-owned land for redistribution to black families. Critics say the land seizures ruined the farming industry and triggered food shortages, inflation and unemployment. The president says the economic crisis is the result of efforts by Washington and Europe, led by former colonial power Britain, to unseat him. A small selection of foreign election monitors have been invited. Many of those critical in the past have been excluded. President Mugabe, 81, has led his party's campaign, although he has said he will not seek re-election in the 2008 presidential election.